Stevie Johnson wasn't content to compete in the local lobster boat races in an actual lobster boat... or in anything resembling a boat at all. 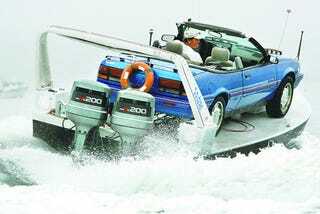 Instead, he created this 400 HP, twin-engine 1994 Pontiac Sunbird convertible powerboat. Insanity. He built one lobster boat with a powerful engine from a World War II-era patrol boat and another with pontoon-like stabilizers that also served as beer coolers. Mr. Johnson showed up at one race in a seaplane piloted by a friend. He convinced officials to put on an exhibition race pitting some lobster boats against the plane, which was supposed to stay sea-bound during the race but was disqualified because it left the water. To make his current boat, Sunbird, Mr. Johnson lopped the top off a 26-foot cabin cruiser, installed a new deck and chained a 1994 Pontiac convertible to the top of it. For races, he controls the boat from the car's front seat. Powered by a pair of 200-horsepower outboards each equipped with its own gas tank, Sunbird is a showstopper at races. During the competition in New Harbor, Mr. Johnson cruised among the spectator boats between races, waving, honking his horn and hamming it up for countless snapshots. "Is that a car or what?" someone shouted. "It's a cah-boat," Mr. Johnson replied, suppressing the "r" in classic New England patois. All the while, his big motors were guzzling gas from the tanks he'd neglected to top off. Strange, and it only goes around 45 mph. On the other hand, 45 mph is faster than what most 1994 Pontiac Sunbird Convertibles still in existence will do on dry land.